ALONG THE WAY......Sharing the Love of GOD for the World. 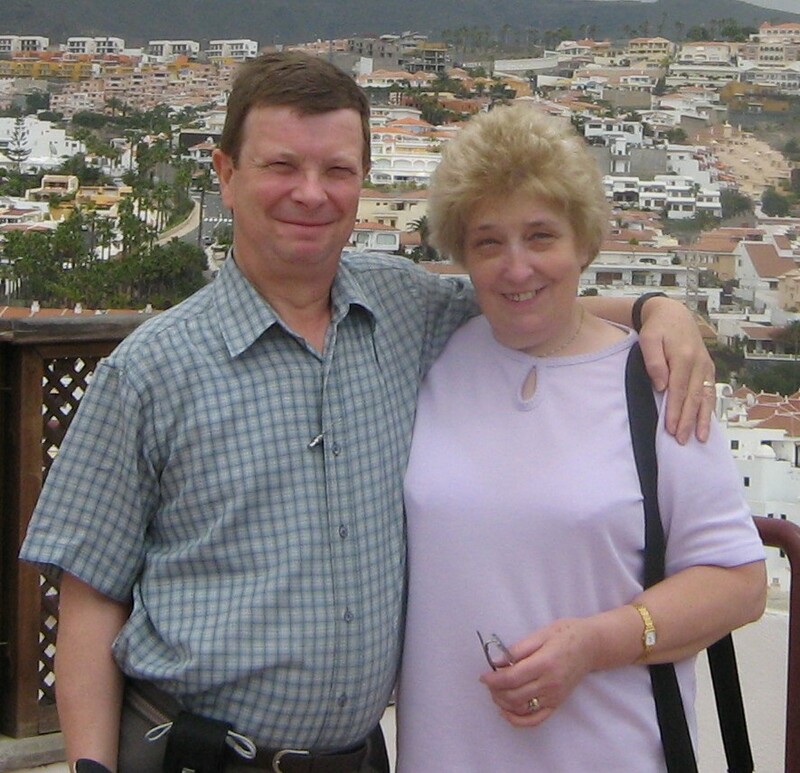 We would like to introduce ourselves-our names are Geoff and Dot, and live in Gloucester, England. We are the wrong side of 50, but still feel young!.....at home lives Heidi, a lovely white-tabby cat adopted from an animal sanctuary in January 2000. Our interests are varied, but share enthusiasm for Railways (Model and Real), Photography, and Computers.. This Gospel is GOD'S Offer of Salvation and Forgiveness to all the Human Race, and is written about in the pages of the Bible, which is the Word of GOD to all mankind, and it's message is vital for every person to know and understand, and act upon. The Bible tells of GOD'S Creation of the World, Mankind, and all in it, and all the Universe. Then of SIN because of Man's DISOBEDIENCE to GOD, in listening to SATAN'S deceiving voice. Then GOD expelling them from EDEN, and the increase of wickedness, culminating in GOD'S Flooding of the World, only saving 8 Righteous People in Noah's Ark. After the Flood, these saved 8 People repopulated the Earth, but SIN was still interwoven in Man's breeding and make-up. Hereon we see GOD'S Plan of SALVATION unfolding, through His Chosen People, ISRAEL. They were constantly turning away from HIM, and most of The OLD TESTAMENT is devoted to their rebellion, and GOD'S Desire in bringing them back to Himself, through the various Prophets, and Messengers from Himself. In The Old Testament, GOD Promises a SAVIOUR for His People, and for ALL Mankind, through the Lineage of King David. Eventually, all Prophecies are fulfilled in The NEW TESTAMENT, in The Birth of The MESSIAH, and OUR SAVIOUR THE LORD JESUS CHRIST. He grew up and lived a SINLESS Life, and was Crucified and ROSE FROM THE DEAD FOR OUR SINS, to be the SAVIOUR of all who will REPENT, TURNING AWAY COMPLETELY FROM THEIR SINS and Receive Him UNRESERVEDLY as their SAVIOUR and LORD, by FAITH. 3. I will never leave you , or forsake you. What words of assurance and hope to all who TRULY receive The Lord as their Saviour from sin. Jesus Said: "Strive to enter in at the Strait Gate..."
There is further Bible Help, Encouragement, and Personal Testimony, in the Link..(Click>).. pages at the end of the Main Pages.. PLEASE SCROLL DOWN UNTIL YOU REACH DESIRED PAGE, OR CLICK ON LINKS TO JUMP TO PAGE NUMBER. The Sheep, The Goats, and The Good Shepherd....PAGE 2. I was a Stranger, and you invited Me in...PAGE 3. For Children, and Grown-ups too!....PAGE 5. The Pearl of Great Value....PAGE 6. Behold! I Bring you Glad Tidings of Great Joy....PAGE 7. Go into All The World and Preach The Gospel....PAGE 8. We have heard the Joyful Sound - Jesus Saves!..PAGE 9. In All Thy Works Most Wonderful....PAGE 10. Seek!...and find Help from The Bible....PAGE 11. One of the days , we decided to walk along the coastal path that runs from Lynton to The Valley of Rocks, and then onto Lee Abbey .....it is a very dramatic and rugged way, with wheeling seabirds , and fine views acros the Bristol Channel to Wales..
We continued onto the Valley of the Rocks, where we climbed the huge rock slabs, and rested along with the colony of wild goats who live on or around the rocks..
One of the photos I took, was of Dot sitting on a ledge with a goat on a similar ledge not many feet above her....Down below was a man coming up the steep path, who vividly reminded me of a modern-day shepherd complete with stetson hat! Where do the goats fit into this ?.....Please read on -it is so very important to each one of us..(Ref. Matthew 25:31-46). Path from Lynton to Valley of Rocks.... Picture of The Man coming to Rescue..
BACK TO TOP OF PAGE 2.. Welcome to "Along The Way"...Page 3 of 11 .....,During our journey throughlife, we all meet many types of people; some we forget, and some remain in our memories, for varied reasons. Some are not as they appear to be---I would like to briefly tell you of one such meeting--- before Dot and I met, one of my holidays was at Palma ,Majorca (it is our favourite island)- and while strolling down to the harbour, I crossed paths with a fellow staggering about, with a ghetto-blaster radio on his shoulders. I confess I cringed at this sight- but he surprised me by putting his hand on my shoulder, and immediately felt comfort and reassurance in me, yet ashamed of my reaction to this stranger. After His crucifixion, the disciples of The Lord Jesus, were walking along the road to Emmaus, near Jerusalem, feeling downcast at the events of recent days. They were joined by a stranger, also going their way.....he talked a lot with them, and as the day was drawing to a close, they invited him to stay in their house with them. Sprinkle chicken breasts with garlic salt, chinese 5 spice seasoning, and a little black pepper Wrap in cooking foil, and cook for about 30 mins. in a hot oven, (190C)...Serve with mixed salad, or stir-fry vegetables. FOR CHILDREN, AND GROWN-UPS TOO! Once again, Welcome to "Along The Way"- Page 5 of 11 ....Our Theme today is ....Seek and You will find...we would like to give you the chance to unravel a Puzzle.!... Can you make a 5 letter word -- "of great value", beginning with "P", in the word "paler"? Did you solve the Puzzle?...The right answer is "PEARL". A Long Time ago, before I met him; Geoff was born and grew-up in the S.E. England, in the County of Kent. There are 2 seaside towns memorable to him--Ramsgate, with it's splendid harbour, & Seaman's Mission; also Whitstable, known for it's Oyster Fishing. Sin will separate us to a conscious Eternal Separation from God (Hell)..
"Behold! I bring Tidings of Great Joy, which will be to all people...." Welcome to "Along The Way"-Page 7 of 11 .... Our title heralds a glorious announcement which has changed Man's history and destiny since it happened 2000 years ago... The incredible scene happened in fields at Bethlehem, before a group of ordinary shepherds looking after their sheep at night... Suddenly, before their very eyes,AN ANGEL OF THE LORD appeared in dazzling splendour... They were dreadfully afraid, but HE told them not to fear, and then announced that"There is born to you this day in the City of David, a Saviour, who is Christ The Lord." Then a host of Heavenly angels appeared, Praising and Glorifying God.....Thereafter, the Shepherds ran and found the BABY JESUS lying in a lowly manger, just as the Angel had said. We are tempted not to believe when we see all the evil things that happen in the world ... Why does God allow this ? , is a common question.... Yet God is Sovereign, and is still in control of all things...these events in Bethlehem are true and did happen, and are for all people in the world. Much has been written and composed around these events--wonderful Classical music, such as "For unto us a child is born", from Handel's "Messiah", inspire us to continue along the pilgrim way. "LORD, now you are letting your servant depart in peace. according to Your Word....for my eyes have seen Your Salvation, which You have prepared before the face of all peoples. "Go into all the world and preach the Gospel to every Creature..."
"Go into all the world......" is the Great Commission of Our Lord Jesus Christ, to all His followers , prior to His Ascension to Heaven and his Father. Our Lord was born in The Holy Land, so it was our privilege, some years ago, before we both had met, to visit ISRAEL. 1...The sacred place where The Lord Jesus was born, now covered by The Church of the Nativity, in Manger Square, Bethlehem. 2...The Sea of Galilee, and the peace of it, on a Sabbath (Saturday) day. 3...The Garden of Gethsemane, where The Lord Jesus sweated drops of blood with his Love forus. 4...The Place called Calvary (Golgotha), where HE was dreadfully crucified for us. 5...The Road to Emmaus, where HE appeared to His disciples, after rising from the dead. Each of these places have special personal experiences of The Lord's Presence, and should encourage each of us to build-up that Most Holy Faith we have. (REF. Jude v.20). These are some of the words of an older Gospel Hymn, which is a favourite of ours...do you know it? Nehemiah was a Godly and upright in heart Prophet, who walked closely in obedience to The Lord God. He had a genuine concern about the ruined state of Jerusalem, and The Temple, and also the idolatrous condition of God's People. The King at this time, was named Artaxerxes , and Nehemiah was one of his trusted advisers, although the King would not have been slow to execute anybody who crossed him! With all this in mind, Nehemiah approached the King, hoping the King would grant his request for leave of absence to go to rebuild Jerusalem. Much instant silent prayer from the heart was offered to The Lord God, by Nehemiah, when the King asked what his request was.! When we truly Repent, and receive The Lord Jesus, we belong to Him, and are His Sheep, and receive the gift of The Holy Spirit. ....Most Sure In All Thy Ways." About an hour's drive from Gloucester, lies the City of Oxford, with it's "Dreaming Spires". At our Wedding last year, we chose "For The Beauty of The Earth" as our first Hymn....if you would like to hear the midi tune, please (click>) on the link at the bottom of this page. 4 years ago, we brought a book called "How we Work - Understanding the Human Body & Mind".. by Dr. Philip Whitfield and Dr. Susan Greenfield. (Published by : Marshall Editions, London). This book simplifies somewhat into understandable text, pictures, and diagrams, the incredibly complex human body. What an indescribably awesome Mind lies behind the smallest action, such as flexing a finger! Who could have designed such a process?? This is not an overstatement, as the Psalmist , in Psalm 139 says--"he is fearfully and wonderfully made!" --The Lord knows all about us from the beginning.. In Romans 3:23-26, we read.."for all have sinned and fall short of The Glory of God, and are justified freely by His Grace through The Redemption that came by Christ Jesus. God presented Him (JESUS) as a sacrifice of Atonement, through faith in His Blood . He did this to demonstrate His Justice, because in His Forbearance He had left the sins committed beforehand unpunished---He did it to demonstrate His Justice at the present time , so as to be Just and The One who Justifies those who have faith in Jesus." John 1 tells us that "...In the Beginning was The Word, and The Word was with God, and The Word was God. In Him was Life, and The Life was The Light of men." Let us learn to be in Awe and Reverence of The Lord God, and His Created World about us. Seek!....and find Help from The Bible. The LORD is merciful and gracious, slow to anger, and plenteous in mercy....(Psalm 103:8-18); Ephesians 4:26; Proverbs 16:32. Let all bitterness, and wrath, and anger, and clamour, and evil-speaking, be put away from you, with all malice....(Ephesians 4:31-32. ); Ephesians 2:11-22. JESUS SAID...For this cause shall a man leave Father and Mother, and shall cleave to his wife: and they twain (two) shall be one flesh...(Matthew 19:4-6. ); Genesis 2:23-24; Hebrews 13:4; Ephesians 5:22-33. And GOD said,This is the token of the covenant which I make between Me and you and every living creature that is with you, for perpetual generations: I do set My bow in the cloud,and it shall be for a token of a covenant between Me and the Earth... (Genesis 9:8-17. ); 1 Samuel 18:1-5. Be sober, be vigilant; because your adversary the Devil, as a roaring Lion, walketh about, seeking whom he may devour....( 1 Peter 5:7-9. ); 1 John 3:7-10; Revelation 20. For the wages of sin is death, but the Gift of GOD is Eternal Life through JESUS CHRIST OUR LORD....(Romans 6:23. ); John 3: 14-21; John 10:25-30. Now faith is the substance of things hoped for, the evidence of things not seen.... (Hebrews 11:1. ); Romans 10:17; 1 Timothy 6:12; Hebrews 12:2. Then said JESUS: FATHER, forgive them, for they know not what they do. And they parted His Raiment, and cast lots... (Luke 23:34. ); Hebrews 4:32; Luke 11:4; Matthew 18:21-22. A man that hath friends must shew himself friendly: and there is a friend that sticketh closer than a brother... (Proverbs 18:24. ); John 15:12-17; James 2:23. ....for He hath said, I will never leave thee, nor forsake thee...so that we may boldly say, THE LORD is my helper, and I shall not fear what man shall do unto me... (Hebrews 13:5-6. ); Proverbs 27:10-14; 2 Timothy 4: 16-18. I will heal their backsliding, I will Love them freely: for mine anger is turned away from him...I will be as the dew unto Israel.... (Hosea 14:4-5. ); Luke 15: 11-32; Jeremiah 3:12. JESUS SAID....When HE, The Spirit of TRUTH, is come, HE will guide you into all Truth: for HE shall not speak of Himself; but whatsoever HE shall hear, that shall HE speak....HE shall Glorify Me; for HE shall receive of Mine , and shall shew it unto you... (John 16: 13-14. ); Psalm 32:8; Isaiah 58:11; Psalm 73:23-24. Heaven is My Throne, and Earth is My Footstool.... saith The LORD.... (Acts 7:49. ); Jeremiah 23:24; Isaiah 66:1; 1 Peter 1:3-4. Better it is to be of a humble spirit with the lowly, than to divide the spoil with the proud... (Proverbs 16:19. ); 1 Peter 5:5-6; Proverbs 29:23; James 4:6. JESUS SAID....I AM HE THAT LIVETH, and was dead; and, behold, I AM alive for evermore, Amen; and have the keys of Hell and of Death... (Revelation 1:18. ); 2 Thessalonians 1:7-9. JESUS SAID....Love your enemies, bless them that curse you, do good to them that hate you, and pray for them which despitefully use you, and persecute you... (Matthew 5:43-48. ); John 15:18-25; Psalm 97:10. And He (Jesus) said unto me (St. Paul), ...MY Grace is sufficient for thee: for My strengh is made perfect in weakness.... (2 Corinthians 12:9-10. ); Psalm 103:13-19. And there arose a great storm of wind....And He (Jesus) was in the hinder part of the ship, asleep on a pillow....and they awoke Him saying, Master, carest not that we perish?....And He arose and rebuked the wind, and said unto the sea, "PEACE, BE STILL," and the wind ceased, and there was a great calm... (Mark 4:37-41. ); Deuteronomy 33:27; Hebrews 13:6; Psalm 91; Romans 10:8-21. (Click) BACK TO TOP OF THIS PAGE? JESUS SAID...I AM The Resurrection, and The Life: he that believeth in Me, though he were dead, yet shall he live... (John 11:25-26. ); John 10:10; Psalm 16:11; Jeremiah 21:8; Deuteronomy 30:15-20. In this was manifested the Love of GOD toward us, because that GOD sent His Only Begotten Son into the World , that we might live through Him... (1 John 4:7-21. ); Romans 8:35-39; 1 Corinthians 13:1-13; John 13:34-35. Behold The Eye of The LORD is upon them that fear Him, upon them that hope in His Mercy; to deliver their soul from Death, and to keep them alive in famine... (Psalm 33:18-19. ); Psalm 103; Luke 6:27-36. ....but thou shalt love Thy Neighbour as Thyself: I AM The LORD... (Leviticus 19:18. ); Matthew 22:37-40; Romans 13:10. Because He (GOD) hath appointed a day, in which He will Judge the Earth in Righteousness by that man whom He hath ordained; whereof He hath given Assurance unto all men, in that He hath raised Him (JESUS) from the dead... (Acts 17:31. ); Hebrews 6:11-20; Romans 8:13-17.. The glory of young men is their strength: and the beauty of old men is the gray head... (Proverbs 20;29. ); Jeremiah 31:12-14; Psalm 92:14-15; Psalm 71;9-10; Isaiah 46;4-5. Children, obey your parents in The LORD: for this is right.. (Ephesians 6:1. ); James 1:22-25; Romans 13:1-7; Deuteronomy 11:26-32. One of His (Jesus) Disciples said unto Him....LORD, teach us to pray...and He (Jesus) said unto them....When Ye pray, say, Our Father which Art in Heaven, Hallowed be Thy Name........ (Luke 11:1-4. ); James 5:16; Acts 2:41-47; Revelation 5:8; Psalm 122:6. Be ye also patient; stablish your hearts: for the coming of The LORD draweth nigh... (James 5:7-11. ); Hebrews 10:35-39; 1 Thessalonians 5:14; 2 Thessalonians 3:5. Flee also youthful lusts: but follow righteousness, faith, charity, peace, with them that call on The LORD out of a pure heart... (2 Timothy 2:22. ); Titus 1:15-16; 1 John 3:2-6. (Click>) BACK TO THE TOP OF THIS PAGE...? Then Peter said unto them, Repent, and be baptised every one of you in The Name of Jesus Christ for the remission of sins, and ye shall receive the Gift of The Holy Ghost... (Acts 2:38. ); Luke 13:3-5; Revelation 3:19. Verily, Verily, I say unto you, He that heareth My Word, and believeth on HIM That sent Me, hath everlasting Life, and shall not come into condemnation; but is passed from Death unto Life... (John 5:24-29. ); 1 Corinthians 15. Recompense to no man evil for evil. Provide things honest in the sight of all men... (Romans 12:17-21. ); Matthew 5:38-42. ....But lay up for yourselves riches in Heaven, where neither moth nor rust doth corrupt, and where thieves do not break through nor steal... (Matthew 6:19-24. ); 1 Timothy 6:7-11; Luke 18:24-27; Romans 11:33-36. For all have sinned and come short of the Glory of GOD... (Romans 3:10,23. );Proverbs 14:34; Isaiah 53:10; John 1:29; 1 John 1:7. For GOD sent not His Son into the World to condemn the World; but that the World through HIM might be Saved.. (John 3:17); Romans 10:8-13; Ephesians 1;7; Colossians 1:14; 1 Peter 1:18-22. JESUS saith unto him, I AM The Way, The Truth, and The Life: no man cometh unto The Father, but by me. (John 14:6. ); Phillipians 4:8; 1 Peter 1:22; Numbers 23:19; Ephesians 4:25; Colossians 3:8-10. In everything give thanks; for this is the Will of GOD in CHRIST concerning you... (1 Thessalonians 5:16-18. ); Luke 22:17-20; Psalm 100:4. There hath no temptation taken you but such as is common to man: but GOD is Faithful, Who will not suffer you to be tempted above that ye are able; but will with the temptation also make a way to escape, that ye may be able to bear it.. (1 Corinthians 10:12-13. ); James 1:12-15; Psalm 1; Matthew 4:1-11. For Wisdom is better than Rubies; and all the things that may be desired are not to be compared to it.. (Proverbs 8:11. );James 1:5; Psalm 111:10. By Faith, Abraham, when he was called to go out into a place which he should after receive for an inheritance, obeyed; and he went out, not knowing whither he went.. (Hebrews 11:8-10. ); Luke 15;11-32. If you would like more detailed Bible Help, please (Click>) onto BIBLE GATEWAY. DO VISIT OUR OTHER PAGES..."ALONG THE WAY....STORIES OF JESUS". PAGE 2...Love Divine, all loves Excelling. To find Foundational Truth about Creation-(click>)Answers in Genesis. Hope you'll enjoy listening while you Browse. Please (click>) here to Read about... "ROCK OF AGES." Do take time see our Two Flash Movies..."In The Beginning"...showing the 6 Day Genesis and Creation events...Film Duration is Five minutes approx. and...."Lo He Comes"...about being ready for the imminent Second Coming of Our LORD JESUS CHRIST. BACK TO THE TOP OF THIS PAGE 11. BACK TO TOP OF PAGE 10.